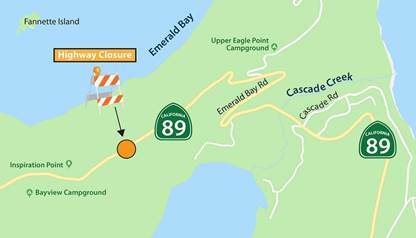 Caltrans is alerting motorists to a full daytime closure of a section of State Highway 89 in Emerald Bay next week. The highway is scheduled to be closed from 6 a.m. to 6 p.m. Wednesday, Nov. 14 to allow for a crane to work in the area placing downed trees on the slope for erosion control. Dead or dying trees were to be cut down from the area around the project site on Tuesday, Nov. 13 and stacked onsite for placement on the hillside the next day. Motorists seeking to access the west or south shores of Lake Tahoe will need to detour via Highways 28 and 50 during the full closure. This work is to complete $4.4 million emergency project that including constructing a 190-foot retaining wall adjacent to a section of the northbound lane of Highway 89.